NASA has successfully sent to space its Delta II rocket carrying the Soil Moisture Active Passive (SMAP) satellite, which for the next three years will be collecting comprehensive data that may help improve the prediction of draughts and floods. 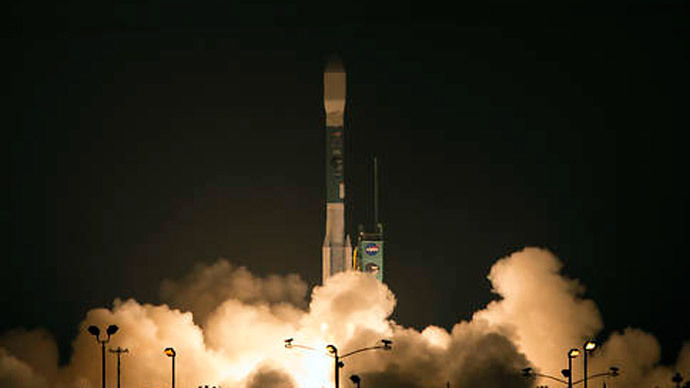 The Delta II lifted off from Vandenberg Air Force Base on California’s central coast, boosting SMAP into the Earth’s orbit at 9:22 a.m. EST (14:22 GMT) on Saturday. “SMAP spacecraft is in excellent health,” SMAP project manager Kent Kellogg said during a post-launch press conference. “We’re in contact with SMAP and everything looks good right now,” said NASA launch manager Tim Dunn. The spacecraft has deployed its solar panels and begun generating power. During the next few weeks, SMAP is expected to reach its operational orbit, which is 685 kilometers (426 miles) high at an inclination of 98.1 degrees. The instruments on the spacecraft will be turned on in 11 days, according to the mission’s timeline. Another three months will be spent on calibration and preparation for routine data collection. The first verified scientific results are expected to be released in about 15 months – the period needed to validate the measurements. Some 45 participants of the Early Adopter program will get access to the mission's raw data to test how it could be better integrated into their workflow. The program includes the US Department of Agriculture, US Geological Survey, US Centers for Disease Control and Prevention (CDC), UN World Food Programme, and various international weather forecasters and researchers. SMAP is a three-year mission to study the Earth’s surface and “produce the highest-resolution maps of soil moisture ever obtained from space,” according to the US space agency. The new data obtained by the space observatory will allow scientists to “better predict natural hazards of extreme weather, climate change, floods and droughts,” NASA said. Currently, the US government issues drought maps and flash flood guidance which are based on computer modeling. SMAP will take real-time measurements that can be incorporated into forecasts, said Dara Entekhabi, the mission's science team leader from the Massachusetts Institute of Technology. NASA’s Jet Propulsion Laboratory manages the $916 million SMAP mission, with participation from the Goddard Space Flight Center in Greenbelt, Maryland. Delta II's launch was initially scheduled for January 29; however, it was delayed by unfavorable weather conditions.